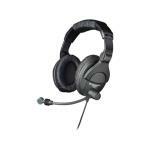 Sennheiser HMD 280-XQ Expert Reviews - Read Reviews and Buy Smarter Online. Verdict: I plug these into my laptop dock. I used a 3-pin XLR female to 3.5mm male stereo mini plug adapter and put it into the mic input and a 1/4" female to 1/8" mini male adapter and plug into the headphone output. I can control the level of both with WebEx. Verdict: I use a W2IHY 8 band equalizer, which feeds a W2IHY EQplus. The 8 band equalizer has, in addition to "ham" microphone connectors, provisions for a standard commercial XLR microphone input. The 8 band also has provisions for matching different impedance microphones.